Unlike fellow tribute act UK Guns N' Roses, Guns 2 Roses will be incorporating Chinese Democracy tracks into their set-list. 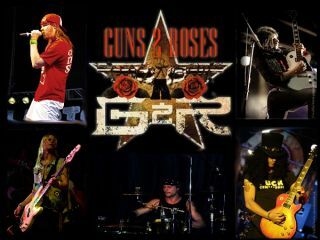 And it was on this promise that GN'R's label Universal Music took the opportunity to showcase the album: "It was ironic because we were putting the night across as a chance to hear new Chinese Democracy songs played by us, " Guns 2 Roses frontman and Axl Rose impersonator Gavin Barnard told MusicRadar. "Universal heard about our night and turned it into an official listening event because we're going to play the new material," he continued. Chinese Democracy will be played in full at 8pm, followed by bands Raising Sand, Plastic Toys, Jettblack and Guns 2 Roses. Tickets are available here.